I woke up this morning feeling much better. I could breathe and smell and taste. All good things indeed. 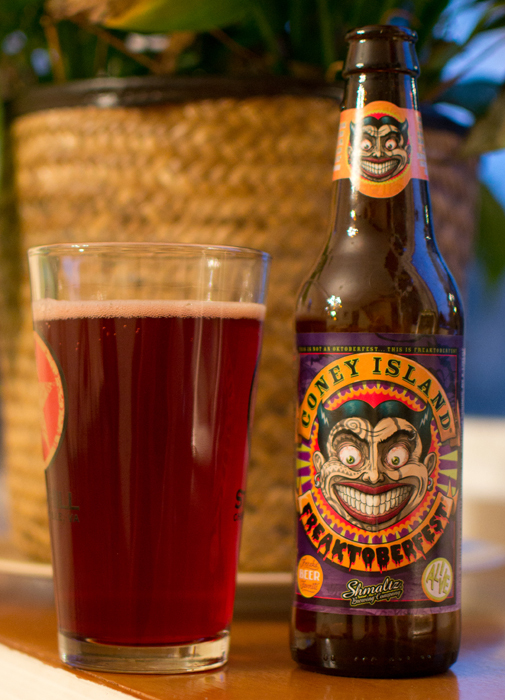 Beer #80 is Coney Island Freaktoberfest by Shmaltz Brewing Company (He’Brew). This is an American Amber/Red Lager. The label noted it is brewed with 6 malts, 6 hops and an ABV of 6.66% and that it is a blood red lager. Sounds like an evil brew not to be taken lightly. Very interesting looking beer was the Freaktoberfest. It poured a hazy shade of red, like a strawberry soda or Vick’s Cherry Nyquil (which tastes nothing like cherry). The head was strange…it was pink. Good thing it didn’t last long as it was a bit odd to look at. It was very weak in the aroma department, a bit of caramel malts and not a hint of hops anywhere. The taste was a bit bready, and not a good bread at that. It had a bit of hop bitterness near the end of the sip and finished off with a odd aftertaste. It had a medium body with a bunch of carbonation, almost a bit too fizzy. It was quite low on the drinkability scale for me, there was something about the appearance and the odd aftertaste that wasn’t at all appealing. This was freaky beer…and not in a good way. The best part of this beer was the label…period. I guess I should give Shmaltz a bit of credit for trying something different, the whole freaky evil thing, but it just didn’t work for me. I think it could work if they would just make this a bit tastier and not so nondescript.